I couldn't resist trying a little test. After my last Tiger print, I wanted to try something a little bigger--but there are limitations both in wood size (unless I get plywood) and paper size (the Japanese paper size I use is pricey and since I'm printing damp, difficult to physically maneuver as it gets bigger). SO I wanted to try a LITTLE, big print. I'm working off another textile idea and it will gradually make sense as I carve and print more. 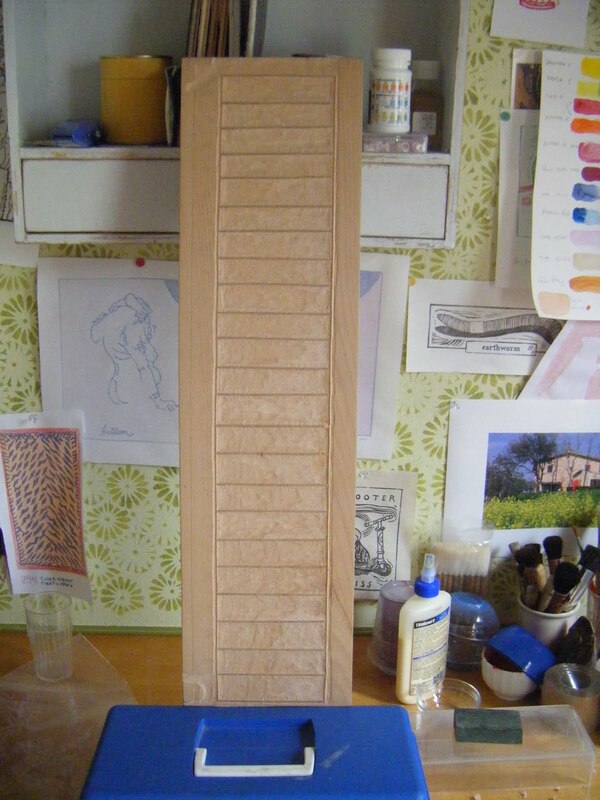 Here's the first block that I finished carving this am. It's a 24" x 6" plank of Beech. It has a lovely, very pronounced vertical grain pattern and despite what the lumber dealer said, it's not so great for woodblock. It carves decently enough across the grain but I have a hard time carving with the grain and keeping my cuts straight. This will be a print made up primarily of rectangles so it shouldn't matter other than it is going to take more time to carve/clear than I wanted to spend on an experiment. Here's a close up just after carving the kento (corner registration) and here's the block upright, in what will be the eventual orientation of the print. Although I'm calling this a keyblock, about half of the lines carved will come off once I've used this as a template for the color blocks yet to come. I'm working the next four days so I'm not sure when I will be able to get back into the studio. 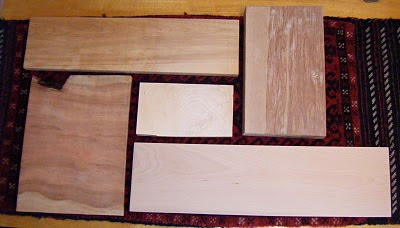 Clockwise from bottom L; Cherry, birch, mahogany, Beech, maple (center). 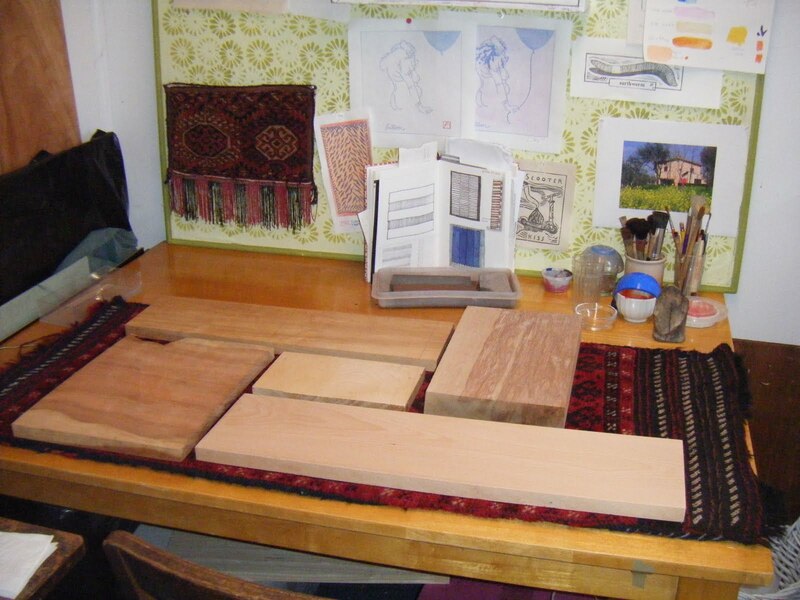 There is something mysterious and provocative about a blank, smooth block of wood. I've had long dry spells, standing in a studio blankly staring at a blank canvas. But unlike a white canvas or sheet of watercolor paper, whose stark white surfaces seem only to emphasize all the works I'll never produce, a WOOD surface invites ideas and seems to prompt whatever muses are out there to shuffle on over for a visit to whisper ideas or remind me of old sketches and untried directions that might be just perfect with this new block. I'll pull out my old sketchbooks and manila folders of doodles and jotted half thoughts and look at the blocks and usually something will emerge. There is something deep and provocative about a new block of wood that prods me forward when I'm stuck and can't figure out what to do next. Today I paid a visit to the local lumberyard--a huge warehouse of mostly fiberboard and plywoods but there is a whole section devoted to local and exotic woods. The staple woods of the local cabinetmakers, luthiers, boat and house builders are all there and I can usually find the odd plank that speaks to me. 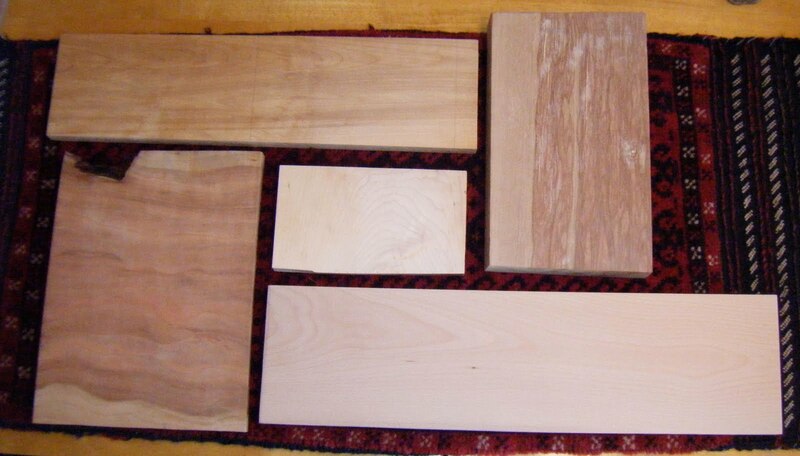 I went looking to see if I could find a nice piece of close-grained cherry but the stuff they had was too knotty. 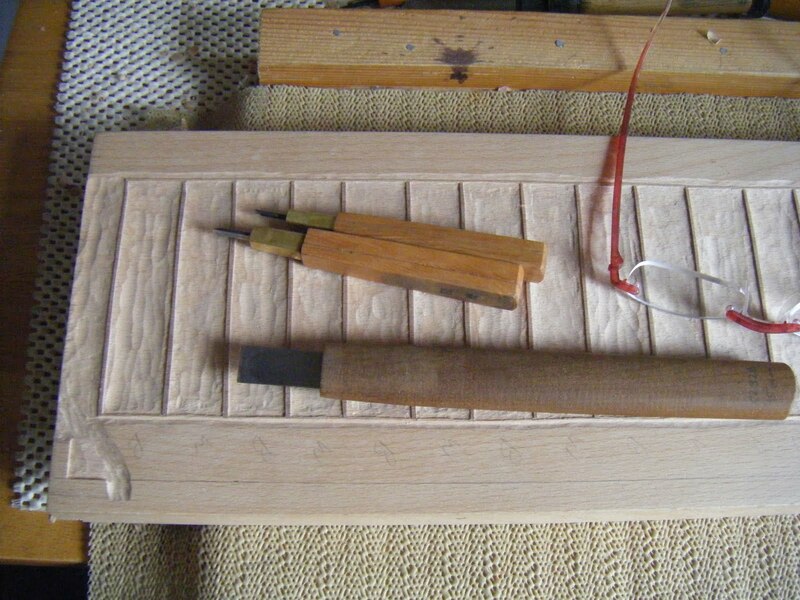 But the local dealer suggested I try out a piece of beech--"the furniture guys usually buy me out, it should carve nice" he said. And sure enough there was a handsome board 10ft long and 8" wide. This will do. I had him cut two two-foot lengths off so I could get it all in the car and drove home. 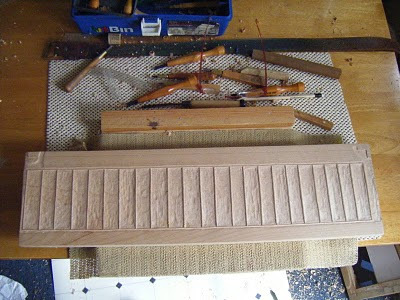 I spent the next few hours sanding smooth one of the 2' lengths. I have a small orbital sander but I did this one by hand, with a sanding block and gradually finer and finer sheets of sandpaper. The board got smoother and smoother, and finally fairly glassy when I got to the 600grit sandpaper. By now I'm covered in fine sawdust, small clouds of yellow flour fall from me every time I move. My hands go over and over the smooth surface. I'm thinking and looking and ideas start coming to me. It must have something to do with the warmth of the wood. Maybe it has something to do with the absolute uniqueness of each and every piece. The grain, the color, the knots and veins, the length and width are always different; the odd scar or burl that meant stress to the tree and means harder wood to the blade that will cut it. I suppose it might be different if I had an assistant or dealer prepare/procure standard size blocks or if I always used plywood sheets. But I won't go that route; not only am I not successful enough to warrant/merit/afford such a service but I'm still enjoying the dialog with the wood. I'm still learning with every print, every block and the process is as important to me as the finished works. I'm finally back in the studio trying to catch up on some unfinished printing. 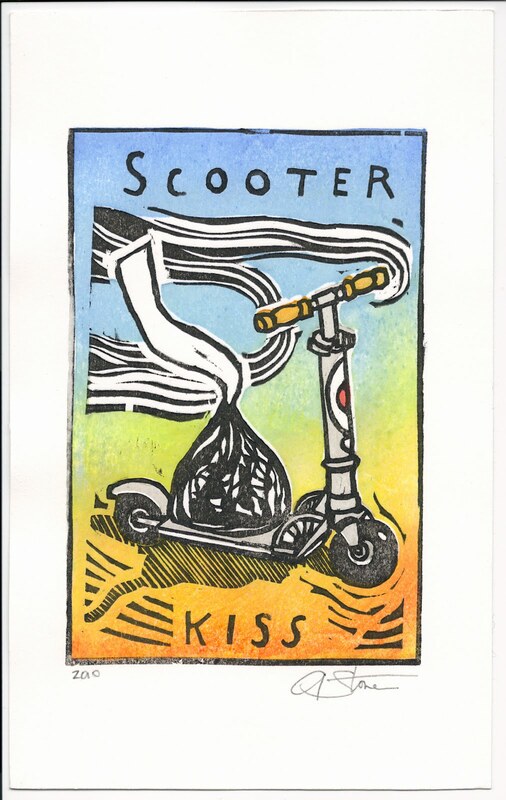 This week a revisit to a print I did in early 2009 in black and white; tipped in watercolor for a wedding gift; decided to carve color blocks and printed a few proofs and then got paper all cut and ready but never got around to printing. 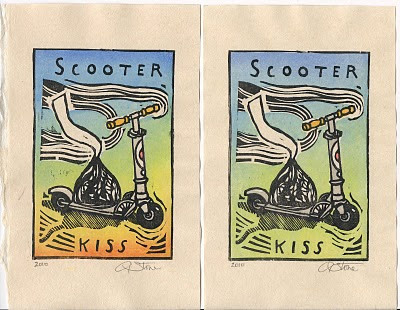 The multicolor background is printed in two to three passes mixing rice paste and water to one end of the block, color to the other end and blending where they overlap before printing. In the rainbow example yellow was brushed out first bottom to top 1/3. Next blue from the top down and lastly a red orange strip at the bottom. The printing was a bit sloppy. I was just printing 25 or so and registration was always a tad off and as I would get things adjusted I'd run out of prints. But I got a good batch done; about half are decent and half give-aways (a bit off-register or a splotch of color in the wrong spot). Mostly I'm trying to finish some unfinished projects before I start on anything new. I'm still mulling over the next work. One of the problems of having to work a real job is now that my artistic production has fallen way off I have new ideas and challenges coming in faster than I can realize the old ones that I never started and I can't decide whether to tackle the "good idea" projects I never initiated or one of my fresher, new ideas that are starting to go in a new direction. So, I solved that dilemma by just pulling out some old blocks and printing away. Basically just procrastinating but thinking all the while about what's going to be next. Well, not sure yet really what I'm going to do with this thing but this afternoon I finally got it all put together. I did some etching and monoprints in college and again later in a few workshops and although I could spend the rest of my life working in and learning moku hanga (hand printed, water-based, woodblock prints) I miss every now and again the plate tone and scratchiness that is so inherent in those other processes and the speed with which an idea can be worked out in monotype. 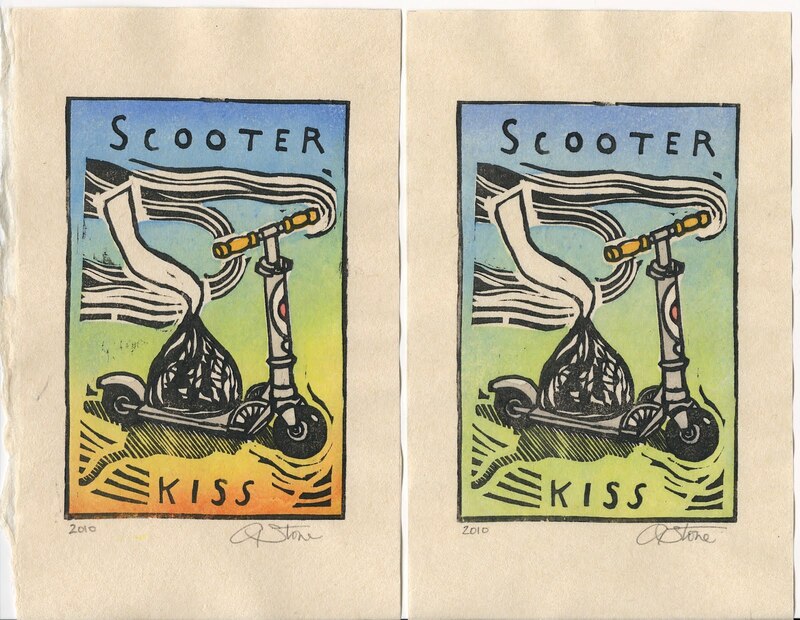 I need a fast and quickly rewarding alternative to the very slow process of carving and printing woodblocks. I've been looking on craigslist and Ebay for about 2 years for a used table press...I wanted something bigger than I usually work in moku hanga but not so big as to cost a fortune. I was hoping for something that would handle a full 22" X 30" sheet of paper . Several came and went. One as I was driving to Monterey to look was sold in the 1hr it took me to get there. One was in San Francisco but the owner decided in the end she really didn't want to sell it to a man. 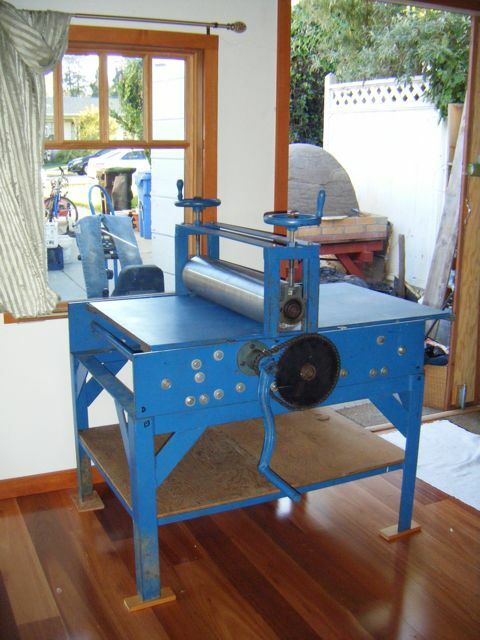 So one morning this showed up on craigslist; one 30 year-old, home-made, 33" X 44" etching press-- and it was in Pacifica, CA (about an hour away on the coast) and still $300 under the amount I had inwardly agreed to budget (squander) under the category, "Tools I really don't deserve/need/or have enough money to buy". I wrote to ask if it was still available and seconds later the owner answered amusedly as he had just posted it 30 minutes earlier! 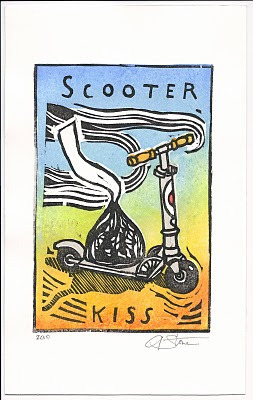 Turns out he was a woodblock printer who was now in his late 60's and had just finished re-printing a suite of prints for his kids before putting away the blocks and selling the press for good. I drove up left a deposit and agreed to come back later that week with a van, a helper, a socket wrench and the rest of the money. So NOW it's May 1. I have a few days off and I finally just decided to stop staring at it and just mount it up in our remodeled garage. 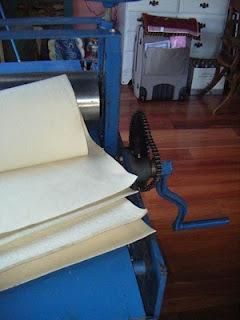 For a home made press it was pretty well thought out. It all comes apart. It all goes back together again easily with the same size bolts. It's 30 years old and a little bit off-kilter but I greased it all up and it seems to be serviceable. The steel bed had been in storage for about 10yrs and doesn't appear warped. The previous user made another bed out of a solid-core door that is 33" X 72" that he used most of the time. That's still tucked away in the shed. It came with blankets and a plastic/acrylic pusher for woodcuts. Hmmm. Now what. I have some ideas bouncing about in my head that I'm anxious to try out and will be looking for some free days to start experimenting but I better get cracking. I'm going to have to produce something to justify this.